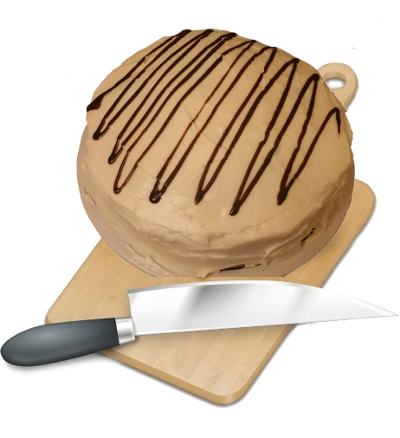 More important than the argument of KDE vs Gnome or Qt vs GTK is the kind of frosting you are using on your cakes. I’m completely serious about this; frosting needs to be delicious and any thought about fat content or calories is not part of the argument. Cake, cupcakes and the like are never everyday food so when you do have it, make it delicious and don’t use artificial garbage. I have continued to use Gnome Recipes as my “system of record” to organize my recipes. I have continued a few recipes, the most important one is this cream cheese frosting recipe. I truly have not had a better frosting that goes better with cake, cookies, brownies… even ice cream. This recipe is even a great base for different directions of flavor. It tastes just as good with adding chocolate chunks, chips or syrup. Turn it into chocolate frosting… although, that can be admittedly a bit rich. This will go great with an angel food with sliced strawberries, blueberries, raspberries and blackberries. Very versatile. I still haven’t found a work around on the units, perhaps using metric only would work better but it is not even properly calculating to other units. It is really the only one issue this program has. Navigate here for my initial experience with Gnome Recipes on openSUSE Tumblweed, including installation and usability. Having the database of recipes on one machine is not very useful on so many levels. Firstly, redundancy is [a] key in data preservation. Secondly, the freedom to add recipes from a different machine than what I am using in the kitchen. Flexibility is very important and maybe someday I will have a 2nd kitchen (not likely) or a more appropriate unit for the kitchen (more likely). My solution is to use Syncthing as for this purpose it fits my needs the best, as I am already running Syncthing on my machines. You can see more on how to set it up here or here. Within the Syncthing-GTK program, you can add this folder as one of your shared folders and add the computer with which you want to share it. Unfortunately when using Syncthing-GTK it uses the default Gnome (GTK) file dialog box and not the KDE Plasma version so you can’t navigate to the hidden folder on either machine. You will have to manually type it in or copy and paste the location from a file manger, like Dolphin, or a terminal application. This irritation gives me pause to think, I should probably look at the Qt version of Syncthing to see how that one has developed in the last year. After setting this up, I am now able to keep synchronized my main machine with my “electronic recipe book” machine, also running openSUSE Tumblweed. The only area of consideration is to be certain is that I only have one machine modify the recipe database at a time. Gnome Recipes is already awesome but there is always room for improvements. The first and most important fix for me would be the unit of measure bug so that it works as a user, like myself, would expect. Whatever unit of measure I choose, that should be the unit of measure it displays. Secondly, the ability to customize the categories to something a bit more useful such as by season or meal type or grouping of my choosing. Lastly, and the most unlikely would be to use the KDE Plasma file dialog instead of the GTK version. The GTK version is frustratingly limited by forcing me to use a “breadcrumb” and “breadcrumb” only style file path instead of the ability to type in where I want to go. KDE Plasma allows you to click on the breadcrumb area to switch it over and allow you to type in your path. Those would be my top three fixes to enhance the awesomeness. There is a sense of satisfaction I get punching my recipes into Gnome Recipes as it is another area that is now better organized. It’s still holding up as a great little program and scratches that culinary itch. I hope that this program continues to be developed and enhanced. Assuming that no features are taken away in the future, this will certainly develop in to a spectacular program.